MyItchyBoy is starting to grow up. It’s true. Apparently, they all do it…. For him, part of being more independent and responsible is looking after his skin and managing his allergies. This is a lot of top of the normal stuff for an average four year old. But then, it’s sadly the only life he knows and he’s not yet too aware that it’s not the same for everyone. Recently we were told that we ‘baby’ our babies in the UK too much. On the other hand, there are more and more children out there developing food allergies. So, although we are perhaps being protective of children (parents of allergic kids do need to ‘hover’ so much more) there are also more children out there having to take on serious responsibility at a young age. Asthmatic children learn at an early age to take inhalers everywhere as allergic children must often learn to take auto-injector pens too. MyItchyBoy is getting more and more awareness of his need to take them everywhere and sometimes asks me if I have them with me when we go out. 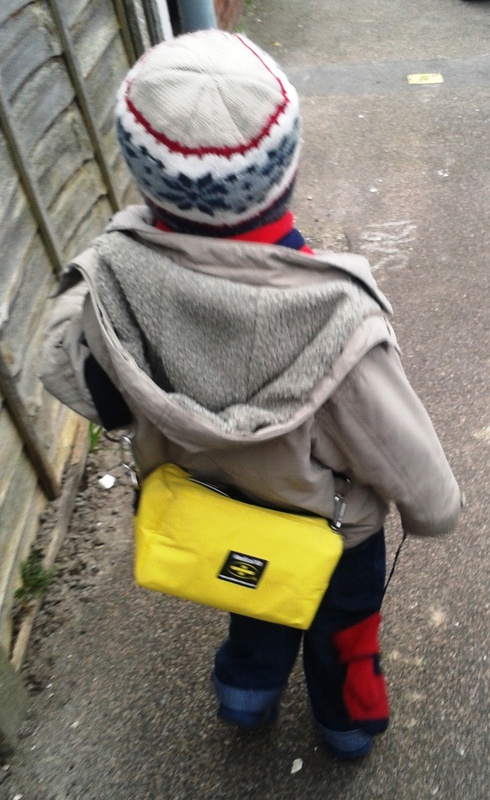 This morning, on our walk to the local nursery he was insistent that he wanted to carry his Yellow Cross bag all by himself. It contains his Epipens, some Piriton and some allergen-free cereal (so he can join in the other kids in their snack). As he dawdled down the hill, chattering away, I was reminded of the images of war-time kids carrying their gas masks everywhere with them. The similarity is definitely there. Both there to save the child’s life in a quick, emergency situation that may come without warning. I’m pleased that he is taking an interest but I’m not sure how long it will last. While it’s fun to walk a short way with your yellow bag when you’re four, I’m not sure how well the interest will last when he’s at school later this year. My son has atopic eczema and he reacts badly to dairy, soya and we are slowly working towards him eating eggs again. He's had a mild anaphylactic reaction to peanuts and has regular flare-ups to random things that we rarely manage to pinpoint. I started the blog to share my experiences and frustrations of having an itchy boy.